I want to interlock using oauth. So, I must get the ConsumerKey and ConsumerSecret in my wiki. I don't know how it can work. Just install Extention:OAuth. I have client's ID, Key, and callback URL. Please How can get it? If you want your wiki to connect to some other wiki or OAuth source, install Extension:OAuthAuthentication. I'm not sure if this extension has been updated yet to work well with most recent versions of MediaWiki, so you may experience some issues when using it. Please note that the OAuthAuthentication extension is written to support logging in via other wikis running Extension:OAuth. I do not believe it supports being a generic OAuth client (for example, to auth against Google or GitHub), but I could be wrong as I've never personally tried it. Click "Request a token for a new consumer"
Click "Propose consumer." You will be given your Consumer Token and Secret Token. Write down your Secret Token now, you will not be able to view it after leaving this page. // Insert other configuration defined by Extension:OAuthAuthentication if needed. Check its extension page on mediawiki.org for more details. 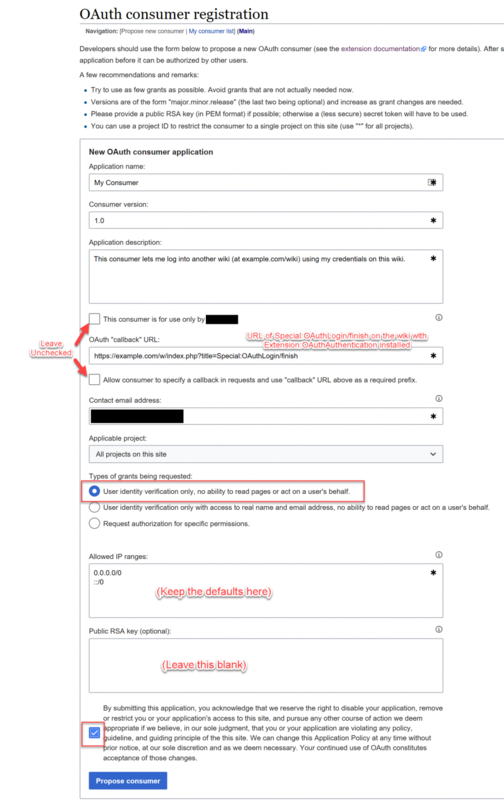 If you are not using Extension:OAuthAuthentication (in other words, you're setting up an OAuth server so that non-MediaWiki clients can log in using wiki credentials), then you will need to configure those clients as step 5 instead of adding things to LocalSettings.php. The Callback URL in your registration in step 2 should also be modified to be appropriate for that external client.